Twin sisters Iris and Malina thought they knew how to reverse the ancient curse that haunts their line, the spell that destines them to use their gleams—unique forms of beauty-manipulating magic—to entice and enchant none other than Death himself. But both sisters thought wrong. Instead of ending the wicked bargain with the power of her infinite bloom, Iris is taken to an exquisite, uncanny realm in between this world and the next—a world Death created for her alone. Only, unlike all of Death’s companions before, Iris’s body goes on the one-way journey along with her soul, arriving in a kingdom never meant to sustain a living girl. Left behind with Niko, her girlfriend, and Luka, the boy her sister loves, Lina searches for a way to save Iris. But as Lina unearths the dark secrets that bind her family to parallel fates of loss and immortality and Iris tries to outwit Death on his own terrain, a power resurfaces that even Mara, the original witch mother, fears. Now both sisters must learn to fully embrace their gleams—or else they’ll truly lose each other forever. 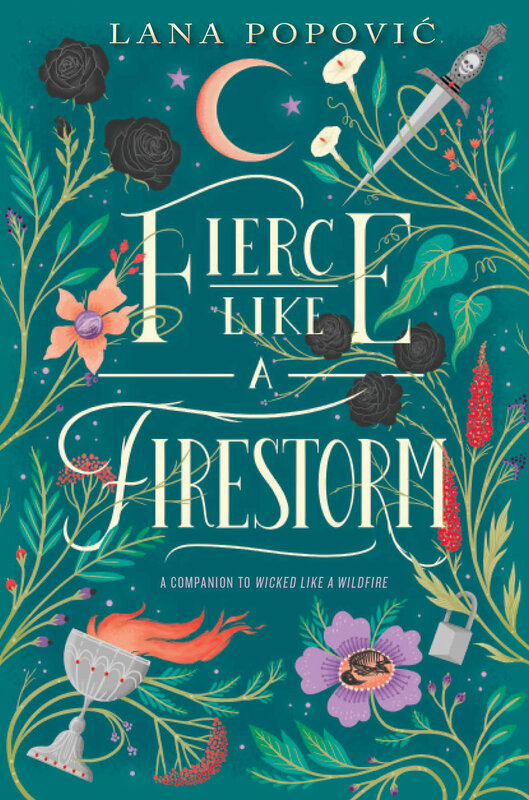 Luscious and breathtaking, Fierce Like A Firestorm is the second book in Lana Popovic’s dazzling duology about freedom, beauty, sacrifice, and the infinite power of love.